The EKE-Electronics Trainnet® Train Control and Management System (TCMS) provides a single point of control over all train sub-systems. The TCMS enables control and monitoring over virtually any sub-system and function, for instance doors, brakes, PIS/PA and video surveillance, to name a few. Using a unique control and management system allows for a simplified Train Communication Network (TCN). The train architecture becomes more efficient, thus saving on development and maintenance costs. In addition, the centralized TCMS is used to automate train operations and sub-system diagnostics, enabling increased reliability and quicker response times. The core of the Trainnet® TCMS is the Trainnet® Train Communication Network (TCN). The Trainnet® TCN is the infrastructure enabling the exchange of information throughout the train. It connects all the train sub-systems together via a common network (or several when requested), enabling centralized control. In practice, the TCN consists of train computers, commonly referred to as Gateways, connected to each other as well as to train sub-systems. Trainnet® Gateways support multiple interface technologies including WTB, MVB, CAN, Serial Links and Ethernet. Please read the TCN and Gateway pages for more detailed information. The Trainnet® TCMS can be used to automate the train sub-systems. In most modern trains, on-board sub-systems generate a large quantity of data which is essential for safety (speed, braking, faults etc.) and operation purposes (system status, energy consumption, video recording etc.). 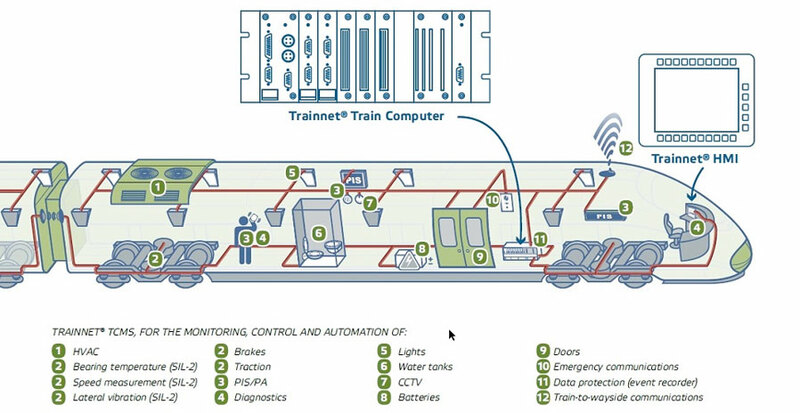 The Trainnet® TCMS is able to gather this data, analyse it, and send logical commands and warnings. The information can be automatically exchanged between sub-systems and conveyed in real time to the train driver, the train captain, remotely located personnel and even passengers. Further information can be found on the EKE Electronics web site.